With careful planning and some investment smarts, you could become SA’s first tax-free savings millionaire. It’s won’t be a quick road to riches but by investing the maximum of R30,000 a year, industry experts calculate that millionaire status can be reached comfortably within 13 to 14 years. Mark Humphreys, business manager of Standard Online Share Trading/Stockbroking, which was recently voted as Intellidex’s Top Stockbroker of the Year, feels the most important factors in accumulating wealth within a tax-free investment account are time and choosing exchange traded funds (ETFs) with adequate risk profiles. Mosaic Invest’s Hennie Loubser points out, though, that most tax-free accounts are invested in money market instruments. While it would not be impossible with a long investment horizon of 10 years or more, cash is unlikely to be the best vehicle to reach the magical R1m mark. He says a growth fund would be a more suitable option. Humphreys believes it’s probably best to ensure portfolio diversity by buying ETFs that track major local and international share indices, preventing any one market from pulling your portfolio down significantly. 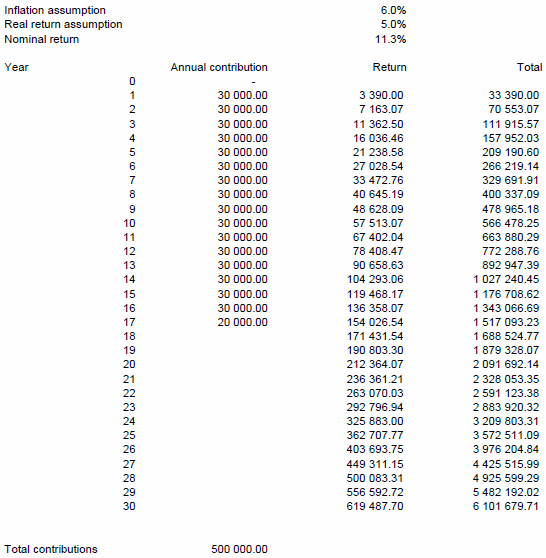 In terms of a time frame, Loubser believes an investor could get to R1m in more or less 14 years by investing the maximum annual amount of R30 000 on 1 March each year – the first day of each tax year – in a fund that can deliver a real return of 5%, assuming inflation is 6%. This, he says, could grow to R6m over 30 years even with the lifetime contribution limit of R500 000, due to the power of compound interest, as illustrated below. The investor invests R30 000 on the first day of each tax year. The investor purchases a top 40 index tracker ETF – and it continues to deliver its long-term historic return of 11.77% annual capital growth and a 2.52% dividend yield (based on STX40 returns Sep 2001 through Sep 2016). Costs of trading are based on Standard’s brokerage rates of 0.25% plus statutory charges (IPL, VAT & STRATE). Dividends plus interest earned on the dividends are re-invested at the start of every new tax year along with the additional R30 000 contribution. “Based on these assumptions, the investor’s portfolio would breach R1m in value during year 13, having made a cumulative contribution of R390 000,” Humphreys says. So … becoming a tax-free millionaire is entirely within any investors reach; all it requires is a bit of discipline, some investment savvy mixed with a dash of patience.